St. Andrew "the First-called" is greatly venerated in the East, especially by the see of Constantinople, which traces its origin to him. Andrew was Peter's brother, and undoubtedly unity between the brothers is his greatest concern. Let us therefore join with Pope Francis and Patriarch Bartholomew I and pray for unity, on this special day for Christians West and East, Latin Catholic, Byzantine Catholic, and Orthodox. As the Pope said in his message, the persecution of Christians today in the Middle East, as well as in many places throughout the world, gives this impetus for unity an added urgency. So also does the call for the New Evangelization. "Christians of East and West must give common witness so that, strengthened by the Spirit of the risen Christ, they may disseminate the message of salvation to the entire world" (Message to the Ecumenical Patriarch of Constantinople for November 30, 2013). 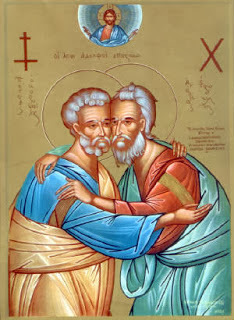 "Let us praise for his courage Andrew the Theologian, first Apostle of the Savior and brother of Peter, for in like manner as he drew his brother to Christ, he is crying out to us: 'Come, for we have found the One the world desires!'" In the prayer, St. Andrew calls Jesus "the One the world desires." We have been created for Him. Our hearts are made for Him. The meaning and mysterious reality of the very impetus of life -- desire -- finds its fulfillment in Him. Perhaps it sounds strange, disappointing, or even incomprehensible at first: "So the meaning of my life is someone from Nazareth in Galilee who was born two thousand years ago?" Even then, Nathaniel understood this feeling very well. His reaction to this news was, "can anything good come out of Nazareth?" And the reply was, "Come and see!" So the Church says today, "Come and see." And just like the first disciples, the Church does not say, "come and see how great we are." She says, "Come and see that Christ is present, here, not by virtue of any power or greatness of ours, but by virtue of His own promise." Daddy and the Kids Go Round the World! Jesus is With Us in Our Suffering... Really!